His Excellency Most Rev. Dr. Vincent Valentine Egwuchukwu Ezeonyia was born on the 5th day of April 1941 to the humble and godly family of late Joseph Ezeonyia and Late Lucy Ezeonyia of Uke Idemili North Local Government Area of Anambra State. He came as the first child and the first son of Pa Joseph who is popularly known for his dexterity in palm wine tapping. Five other children followed after his birth namely: Godfery Ezeonyia, Cyril Ezeonyia and Simon Ezeoyia; others are Mrs Theresa Nweke and Mrs Elizabeth Anaeli. While growing up, the young Vincent distinguished himself from his mates by his rare candour, urbanity, resilience, and commitment in all designations. He began his primary education in 1947 at St. Dominic’s primary school Uke (now Okaa-Omee primary school Uke).Three years into the primary school his cousin who was living in the northern part of Nigeria took him to Zaria (present day Kaduna State) where he had a short sojourn. Egwuchukwu as he was fondly called in the local community had always desired to be a priest and had indescribable awe and love for God. It was not surprising then that he opted to go to the seminary instead of pursing some lofty degrees from the secular universities. A further confirmation of the depth of his commitment was his preference of a religious congregation where he would profess, activate and actualize the evangelical counsels of poverty, chastity and obedience. Based on the latter, he applied to the Holy Ghost Congregation at Ihiala Anambra State in 1951 and he was admitted immediately. Thereafter he proceeded to novitiate at Awo-omamma in Imo State where he took his first religious vow on the 12th of February 1962. Thereafter he proceeded to the Spiritan Institute of Philosophy Isienu Nsukka to further his training for the Catholic Priesthood. While in the major seminary “bro Vin” as he was fondly called endeared himself to both the seminarians and the formators by his unassuming personality, kindness and resourcefulness. He was committed to his duties and excelled in all areas of the seminary formation. He was also conscientious and had a vibrant enthusiasm for sports as he excelled in the game of Lawn Tennis which was also a passion he held to till his death. The soft spoken Doctor of the Classics was ordained a Catholic priest on 3rd August 1968 in Ukeh by Francis Cardinal Arinze. After his priestly ordination, his first parish assignment was in Egbema in Imo Sate an area which was an entirely mission ground. His pastoral valour and commitment in Egbema had a far reaching impact that the people still remember him with nostalgic gusto. Thereafter he became a formator and later the Chaplain of St. Peter’s Chaplaincy University of Nigeria Nsukka where he distinguished himself as a caring chaplain and motivator. Bishop Vincent Ezeonyia was among the distinguishable trailblazers of the Holy Ghost Congregation in Nigeria. Apart from being a formator (dean) of seminarians in Bigard Memorial Seminary and later Spiritan Institute of Theology Atakwu Enugu, he rose to the status of Provincial Superior of Nigeria-East in 1980 and thereafter he was elected as Assistant General under the mandate of Fr. Frans Timmermans at the Holy Ghost Generalate in Rome. Our amiable and compassionate bishop was not lacking in terms of academics as he undertook further studies in Ireland and in the United States of America and emerged thereafter with a fantastic doctorate degree in the Classics. His homilies and talks were normally seething with vivifying classical stories which included but not restricted to Greek legends and most exciting and educative fairy tales. Within the time of his episcopacy he wrote a good number of works that can best be described as cerebral most of these are condensed in his Lenten pastoral letters. Most Rev. 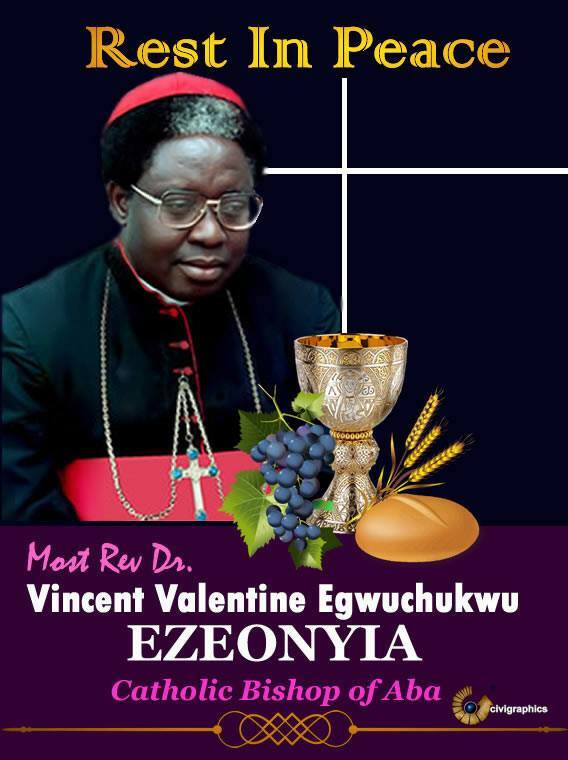 Dr. V.V Ezeonyia was appointed a Bishop by Pope John Paul II on 2nd April 1990 with the creation of the Catholic diocese of Aba from Umuahia diocese. That was the same year he returned from Miami USA where he worked for Haitian Refugee Service. With his appointment as a Bishop, he became the first Bishop of the Catholic Diocese of Aba. On 1 July 1990, he was ordained a Bishop by Archbishop Paul Fouad Naïm Tablet the Titular Archbishop of Sinna with Late Bishop A.G. Nwedo and Late Archbishop A.K. Obiefuna as co-consecrators. It is also pertinent for the records that he was ordained alongside Most Rev. Dr. Lucius Iwejuru Ugorji the current Bishop of Umuahia who replaced the late Bishop A.G Nwedo. Our ecclesiastical hero, Most. Rev. Dr. V.V. Ezeonyia, took canonical possession of the Catholic diocese of Aba on 2nd July 1990 in a ceremony of episcopal installation at Christ the King Cathedral Aba. The clergy and laity of the Catholic diocese of Aba will not forget the great and enviable works of the prelate in a hurry. A man of aesthetics and modesty. In the nearly twenty-five years of his tenure as a Bishop he accomplished so much that only a sizeable book can adequately contain and detail. He lived strictly by the motto of his episcopacy namely; to serve with joy. We recall with inebriating joy the amazing transformation of the then CKC parish church to an enviable Cathedral. The Bishop’s sense of aesthetics brought desirable beauty and finesse to bear on the entire infrastructural development of diocese. Just before his demise he began the building of the new diocesan pastoral centre with the great supportive hands of Chief Tony Enukeme (CEO Tonimas Group) who laid the foundation of the foreground. This space may not be sufficient enough to present the litany of pastoral and infrastructural projects that he started and completed. Within the period of his episcopacy, a lot of parishes sprang up in geometric rhythm. He organised and saw to the sitting of two highly productive diocesan synods. He encouraged education among the clergy and today the diocese can boast of many priests and religious who are masters and doctoral degree holders in various disciplines. Our highly empathetic Bishop was always at the service of the old and ailing members of the clergy and the religious. A good number of priests and religious can attest to his fervent compassionate attention and touch on them as well as on their families. He always cried with those who cried and felt the pain of those who were wounded. Among the laity he directed and gave boost and zest to the erection of Catholic Schools which are located in a good number of parishes in the diocese. He also saw to the inauguration of a formidable diocesan education commission as well as a very efficient communication office with a printing press. Furthermore, pastoral excellence was his driving force and he made sure that the laity were given maximum pastoral care and attention. Every life has a beginning and must necessarily have an end. The ebullient, caring and compassionate prince of the church and the able Shepherd of the Catholic diocese of Aba answered the inevitably call to the yonder world, which marked the end of his earthly life, in the early hours of the 8th day of February 2015 after a very brief but harrowing illness. Few days before he took ill and later died he was seen performing various functions which included the burial of Msgr. P. Onyeachu on the 29th of January 2015 in Ahiara diocese. Our legendry Shepherd lived a life of prayer and constant attention to the triune God the source and origin of his life and strength. His advertence to community life was very infectious and effectual. Here lies a man that was saturated with the milk of human kindness, here lies the remains of Shepherd who bore bruises and insults for the sake of his sheep, here lies the true portrait of a religious who stood and lived by the letters of his vows, here lies the body of a soldier of Christ who would never bat an eyelid until victory is won, here lies the body of a prelate who put his life on the line for peace to reign finally. The pain in deep and the loss is profound for his family and friends, the Catholic Bishop of Nigeria, the priest and laity of the Catholic diocese of Aba. This is a reality that all of us will necessarily come to accept. His Excellency Most. Rev. Dr V.V. Ezeonyia came, he saw and he served to the greater glory of God May God rest his gently soul in peace. Goodnight his Lordship! His Lordship Bishop Valentine Vincent Ezeonyia, your birthday was on the 05th April 2017 as we remembered you today. Words are a pretext. It is the inner bond that draws one person to another, not words. We all knew that you love us [PAPA HIS LORDSHIP V.V. EZEONYIA] and we still belived that the opposite of love is not hate, it’s indifference. The opposite of art is not ugliness, it’s indifference. The opposite of faith is not heresy, it’s indifference. And the opposite of life is not death, it’s indifference.